Walter Michael Waritsky - Edmonton's Burial & Cremation Professionals | Trinity Funeral Home Ltd. It is with great sadness that the family announces Walter’s passing on February 11, 2019. 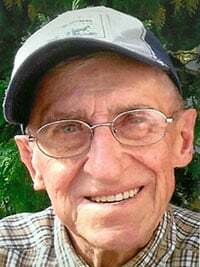 Walter was born October 28, 1927 in Mountain Park, Alberta, the first son to Anna and Jim Waritsky. Walter will be fondly remembered by his daughter Shawn and son Paul (Lynn), brothers Edward, Alex (Linda), sister Mary (Gordon) Carey, and nieces and nephews who will miss him forever. He was predeceased by his daughter Michelle. Walter’s request was that there be no formal funeral service. A private family memorial is planned for the spring. Should friends so desire, donation in memory of this gentle, caring man may be made to the Heart and Stroke Foundation. This was something that Dad asked me to read to him the last time we visited at Jubilee Lodge. I gladly did so for he and his table mates. My condolences to all our family and friends! Love you Dad! Gone, but never will you be forgotten in our hearts. When I have cross’d the bar.